CLICK for many more illustrations ! This ship is very important in your first dream of the New Year. 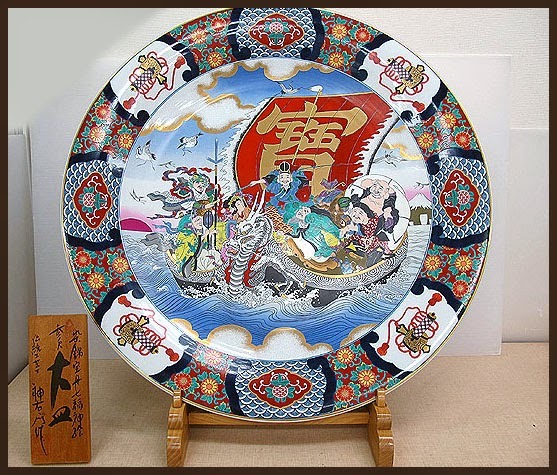 This is in a set for the New Year, with the Seven Gods of Good Luck in the Treasure Boat on one and the Tsurukame Crane and Turtoise for long life on the other. 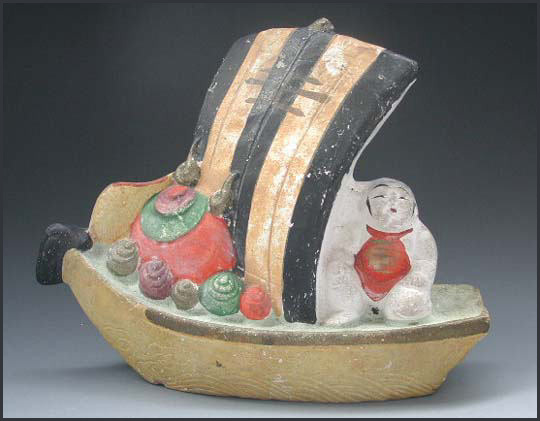 The Treasure Boat hangs outside of the entrance to lure in Good Luck, the Tsurukame hangs in the sleeping room. 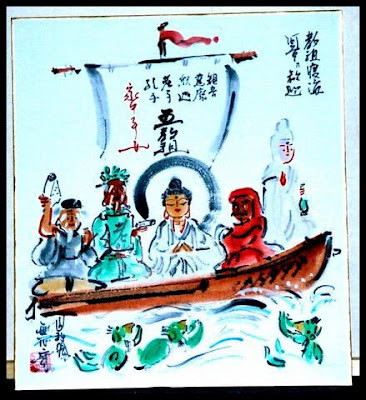 If for some reason the first dream of the year was not auspicious, you could float the paper with the boat down the river and get rid of the bad luck this way. From the shrine Tsumagoi Jinja 嬬恋神社 in Tokyo.
. First Dream (hatsu-yume 初夢) . 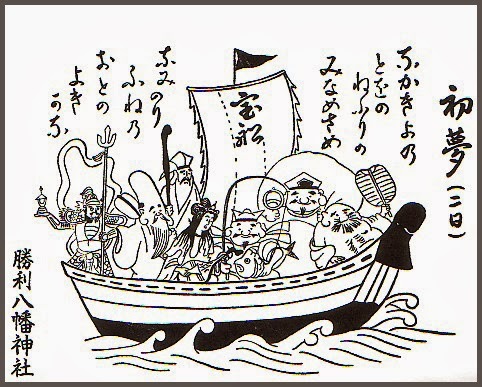 On New Years Eve the deities enter port on a takarabune (treasure ship) to bring happiness to everyone. Tradition says that sleeping with a picture of the shichifukujin aboard the takarabune under your pillow on January first ensures your first dream of the New Year will be a lucky one. Maybe the dreamer will even end up in seventh heaven. Another curious custom involving the treasure boat is the chanting of a song-like palindrome (a verse that reads the same backward or forward). Children are told to chant the verse three times before going to sleep. See below for one example.
. 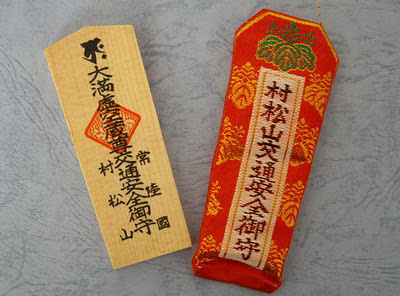 Seven Gods of Good Luck 七福神 and Daruma .
. Shichifukujin　七福神 Seven Gods of Good Luck - Amulets . 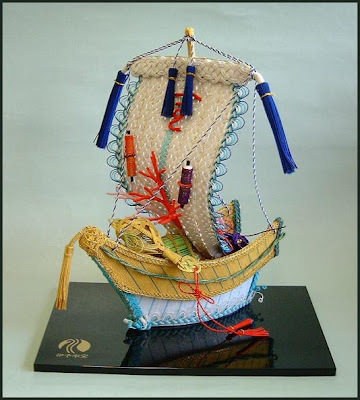 This is a children's toy, a miniature of the real fishing boats of the region. 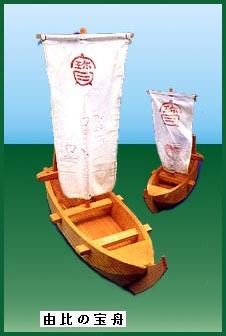 Every year on the 15th of January and 13th of April, at the temple for Kokuzo Bosatsu 虚空蔵堂 (Kokuzoo Doo) of Muramatsu village this boat is sold at the auspicious market. In the back of the boat, the Chinese character for "treasure" takara　宝　is painted in black. On the side, three scales of a snake are painted in black and red. On the bottom of the boat, the sea is painted in blue waves. 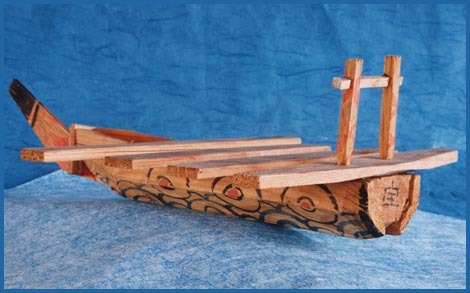 There are three special boards (tarashi タラシ/ 桁) above the snake scales, which helped stabilize the boat during a storm. Muramatsu-san Kokuzo-do is a temple established by Priest Kukai in 807. Since then it had been under the protection of the successive domain lords of Satake clan for 500 years. 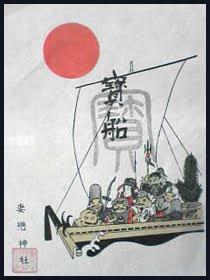 In the Edo period, Tokugawa Ieyasu dedicated the land that produced 50 koku of rice to the temple. It flourished under the protection of Tokugawa Mitsukuni. In the back of the main hall is Muramatsu Daijingu Shrine, to which the deity of Ise Shrine was imparted during the reign of Emperor Kanmu (737-806). The shrine is famous for the custom of “Jusan Mairi,” in which 13-year-old boys and girls visit the shrine to pray for their future success of life. 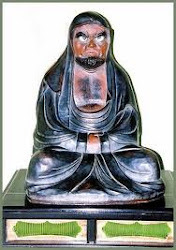 Kokuzo-do now belongs to Buzan School of Shingon Sect. Its main object of worship, the image of Kokuzo Bosatsu (Buddhist deity of wisdom and memory) is counted as one of 3 Finest Images of Kokuzo Bosatsu in Japan together with Asama Kokuzo-son in Ise and Yanaizu Kokuzo-son in Aizu. At the present time it is visited by a lot of people seeking for escaping evil spirits and success of life.
. Sakura ebi sushi 桜えびすし sushi with sakura shrimp . 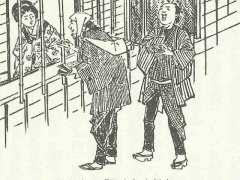 They were very popular in Edo and even walked through the pleasure quarters. I seem to hear the sweet sound of a boat sailing through the waves. The Chinese character, baku 獏, a Chinese imaginary animal which is thought to devour (i.e. prevent) nightmares, is sometimes found written on the sail . Often auspicious cranes and tortoises are depicted in the sky and the sea. 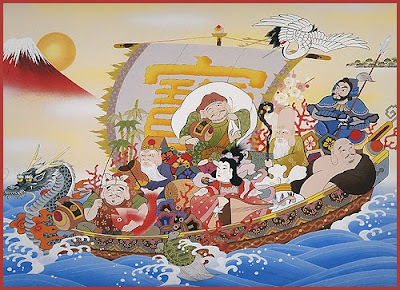 Although the origin of treasure-boat paintings is not clear, one Edo period record indicates that they were started in the Muromachi period. According to a different source, they were originally imperial gifts to high-ranking courtiers in celebration of the New Year. It became a popular custom among common people in the Edo period to place takarabune pictures under one's pillow on the second night of the New Year to induce auspicious dreams and resulting good fortune.